Order within 13 hours 59 minutes for Same Day Delivery! From award winning Big Picture Farm, Townshend Vermont! 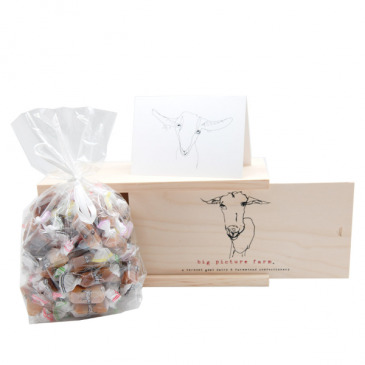 Includes 50 caramels, assorted flavors*. All housed in a beautiful wooden box custom made for Big Picture Farm by the good folks at the Vermont Wooden Box Company. This is really over the top! Please order 3 days ahead if possible, or call the shop to confirm availability. Flavors* ORIGINAL SEA SALT & VANILLA original sea salt & bourbon vanilla -- this caramel was selected as the 2012 outstanding confection and awarded the gold SOFI at the prestigious Fancy Food Show. MAPLE CREAM featuring maple syrup from Plummer's Sugarhouse in Grafton, VT. This is a very popular flavor. CHAI Winner of a 2015 GOLD SOFI For BEST CONFECTION and a 2013 Good Food Award! Made with organic chai supplied by friend Neil Harley of Vermont's own Chai Wallah. COCOA LATTE Winner of a 2013 SILVER SOFI for outstanding new product! It features local favorite Mocha Joe's Espresso & Askinosie White Chocolate made with Goat's Milk. RASPBERRY RHUBARB - WINNER OF THE 2015 GOLD SOFI FOR OUTSTANDING NEW PRODUCT (top prize across all categories)!!! And a 2015 GOOD FOOD AWARD Winner! CIDER HONEY - Made with Vermont Apple Brandy and Pure Vermont Cider Jelly. Also features Vermont organic honey. WILD CHOCOLATE MINT - The goats gave permission to thieve some wild mint from their pastures in order to make this decadent new iteration -- also features organic dark chocolate. BROWN BUTTER BOURBON - A very popular new flavor for good reason. Made with Vermont Bourbon (which is made with GMO-free VT corn) and organic brown sugar. A 2015 GOOD FOOD AWARD Winner! 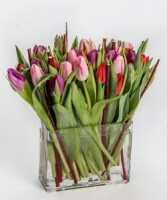 Assorted pink, red, and purple tulips along with branches neatly arranged in this wonderful keepsake rectangular flask vase! This is a vase that will be kept for future use! This is one of our favorite tulip arrangements! The vase alone measures about 6" wide x 6" tall x 2" deep. The colors will vary with availability, but we always put them together with style! 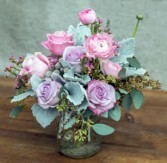 This sweet desk sized arrangement features pink and lavender seasonal flowers such as roses, spray roses, carnations, lisianthus, and dusty miller. Depending on the time of year it can also include veronica and tulips! It will always be pink and lavender, gardeny, arranged in a canning jar! The specific flowers and accents will change with the season, but the overall look and feel will be just the same! AVAILABLE FOR DELIVERY STARTING FEB 12, 2019. Carnations are a traditional expression of love and devotion. They have timeless, long lasting beauty. Let this 25 stems of colorful carnation flowers with a collar of simple greens to deliver your love this Valentine's Day! If we run short on red and pink we will sub with other holiday colors!